Could few stacks of post-its and a wall make a difference in your team performance ? Welcome to our living & breathing Kanban View board. If you happen to visit our office, this is what you would see in our meeting room. Our glass wall filled with matrix of post-it that might as well look like a designers new art installation. This is our living Kanban board. It not only helps in our agile software design and development activities but almost anything that we do in PsiberTech Solutions. The term Kanban comes from Japanese word which means Signboard. Toyota Production System used Kanban physical cards to support non-centralized pull production control and achieved greater results in production. Thanks to its scalability and flexibility Kanban view is used all over the world from manufacturing to software industry to visualize and manage project tasks. 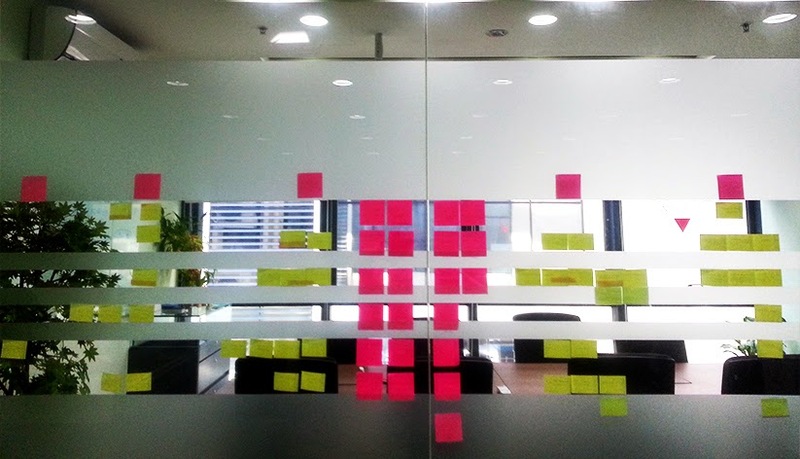 At PsiberTech Solutions we use Kanban view in two ways. 2. Shared Kanban view wall that works as a top level guide to projects. Our shared Kanban view wall is living and breathing with latest project status and updates. Here are the 4 main advantages we have earned from using Kanban view. Nothings beats the tangible feeling of handling something physical. 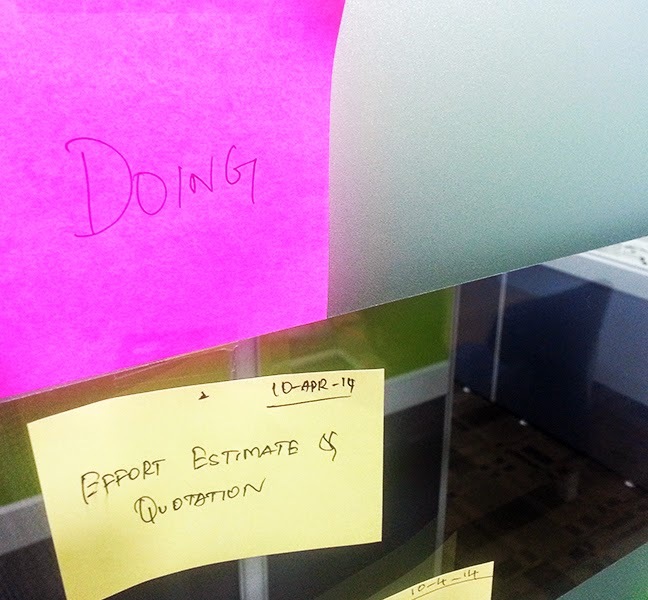 Our Kanban view contains columns that says “To do” “Doing and “Done” We move our task post-it from “To do” stage through “Doing” and “Done” stage physically. Sometimes the post-it are moved into tables and handbooks as reminder for doing something. You got to give it to the feeling of accomplishment when you move a post-it to “Done” column. Perhaps the most important aspect of using Kanban view is because of this particular advantage. Tasks are pulled from “To do” pool by respective people who are responsible for that task. The downstream process is more realistic and sustainable approach to segregate the task amongst peers. We have simplified many aspects and kept the process cycle very clear. The process is self-directing to the person who owns it. The job is simple, move things to “Done” column. And if Iteration happens move it back to “To do”. Completed tasks are discarded periodically making way to new ones to the central pool. It’s hard to pass through the wall full of post-its that’s screaming about what you need to do, especially the one in the meeting room. Visual reminders help us to keep the focus on what’s important amidst the numerous time consuming distractions at work. The challenge is to write that task down in the piece of post-it and pasting it in the column of “To do”. Also living Kanban view does not document tasks for future reference, that’s why we have project level Kanban view software that enable us to micro manage each task. Are you using Kanban view for your project management? What do you think about living Kanban view board? Please share your views in comments.